Pretty much simultaneously, apparently, in October the state Board of Elections (SBOE) conducted a "random audit" of NC House Speaker Tim Moore's campaign finance reports while a WBTV investigative reporter was also poking around into the campaign reports of all the Charlotte-area members of the NC General Assembly. Bottomline: the SBOE audit found that Moore had failed to itemize tens-of-thousands of dollars in payments his campaign made with a credit card from 2007 to 2015, a requirement in campaign finance law that was enacted in 2006 (went into effect on Jan. 1, 2007). Tim Moore was both a listed sponsor of that bill in 2006 and voted for it at every reading, including on final passage. Yet he has been in constant and consistent violation of it. The Tim Moore campaign busily set about amending the reports covering 2005-2015, with the WBTV investigative reporter hot on the story. That reporter's name: Nick Ochsner. The emergence of Ochsner's name as the target of state GOP Executive Director Dallas Woodhouse's poison pen (illiterate as that pen happens to be) has now become the story. Seems that Ochsner, while working in Raleigh and before he joined the team at WBTV, was approached by the Tim Moore people with a job offer: Would Ochsner consider becoming Moore's communications director? Ochsner said of course he might be interested but that he was also trying to relocate to Charlotte, where his wife was working. That ended the job feeler. 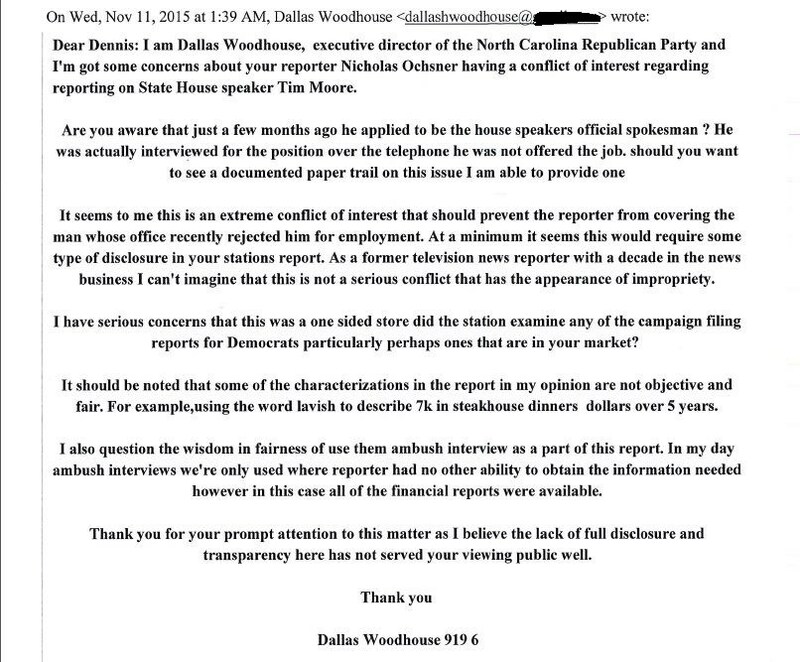 Ochsner subsequently landed the job at WBTV, and now he's broadcasting news about Tim Moore's failings at following NC campaign finance law, and Dallas Woodhouse, the new and thuggish Executive Director of the NC GOP, doesn't like it one little bit. Woodhouse wrote Ochsner's boss at WBTV that Moore's interest in hiring Ochsner should disqualify him from reporting on issues related to the North Carolina General Assembly. Seriously. "It seems to me this is an extreme conflict of interest," wrote Woodhouse, "that should prevent the reporter from covering the man whose office recently rejected him for employment." "Are you aware that just a few months ago he applied to be the house speakers official spokesman? [Not true. He didn't apply. He was recruited.] He was actually interviewed for the position over the telephone he was not offered the job. should you want to see a documented paper trail on this issue I am able to provide one." WBTV was not impressed by either Woodhouse's attempt at bullying or his writing ability: "Being approached about a job and having a phone call with an interested potential employer is not a conflict of interest. Nick's reporting has been fair and based on facts. I welcome all scrutiny of the facts of the story." The attempt to silence Ochsner did not stop there. Representative Charles Jeter (R-Mecklenburg), who is the House Republican Conference Chair, emailed all Republican representatives instructing them not to talk with Ochsner: "I wanted to follow up on the Speaker's note from the weekend. If Nick Ochsner the reporter contacts you I urge you to not take his calls." Jeter then repeated the conflict of interest claim concocted by Woodhouse. Thanks Jerry for this report.